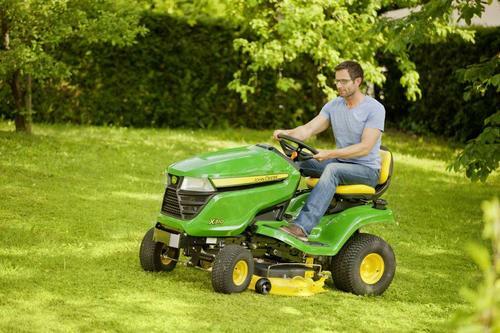 John Deere is adding new models to its extensive range of riding and walk-behind lawn mowers for 2014. The new X310 lawn tractor features power-assisted two-wheel steering for an easier and more comfortable ride, and is equipped with a hydraulic power lift to allow effortless adjustment and control of the rotary mower deck. With a cutting width of 107cm (42in) and a height of cut from 25 to 102mm (1 to 4in), this lawn tractor is suitable for areas up to 8000m2. The X310 is the newest member of the proven X300 Series of John Deere lawn tractors and the whole range has been redesigned for 2014 to present a fresh and modern appearance. Prices of the new X310 start at £4320 (including VAT). Homeowners can now mow their lawns faster, more easily and more efficiently with John Deere's new Z235 zero-turn radius (ZTR) mower. This latest model in the EZtrak ZTR range has been redesigned to offer a compact, easy to use machine especially for smaller or more intricately landscaped gardens with up to 8000m2 of grass to cut. The mower’s 360-degree turning ability makes it highly manoeuvrable and reduces the number of passes required to mow the garden. The Z235 costs £4000 (including VAT). Next year sees the introduction of the all-new RUN Series of walk-behind lawn mowers consisting of three models, the RUN 41, RUN 46 and RUN 51. Equipped with working widths of 41, 46 and 51cm (16, 18 and 20in) respectively, RUN Series models are suitable for maintaining gardens ranging in size from 1000 to 2000m2. Designed to make mowing easy and convenient at an affordable price, the new John Deere RUN Series lawn mowers start at £430 (including VAT) for the RUN 41 model.